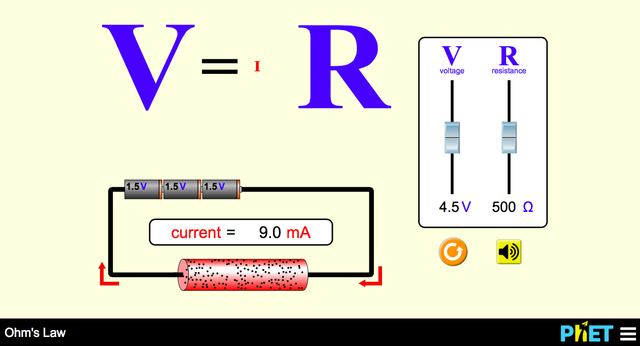 See how the equation form of Ohm's law relates to a simple circuit. Adjust the voltage and resistance, and see the current change according to Ohm's law. The sizes of the symbols in the equation change to match the circuit diagram. As you change the value of the battery voltage, how does this change the current through the circuit and the resistance of the resistor? If the current or resistance remains constant, why do you think? As you change the value of the resistance of the resistor, how does this change the current through the circuit and the battery voltage? If the current or voltage remains constant, why do you think?